Ask us what influences our personal style, and we’ll gladly cite things like watching Diane Keaton in Annie Hall while we were growing up. Or maybe we’ll reach into our back pockets to list one of the names routinely recognized as “style icons” like—shocker—Audrey Hepburn or Grace Kelly. But what about those things we're not always conscious of as having an influence over what we wear? It's those aspects of yourself like where you’re from that tend to come through your personal style in much more nuanced ways. We asked our community of Who What Wear readers how they think where they grew up influences their style, and their responses are fascinating. Today though, we were inspired by a style journey that goes beyond international borders: that of a first-generation American. For Mekdela Maskal, personal style is, well, personal. 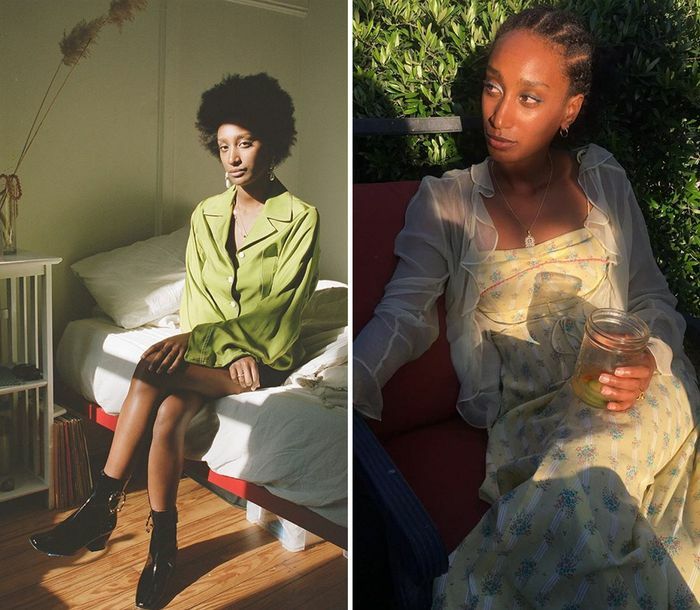 Raised in California to Eritrean and Ethiopian parents, the NYC-based media activist has cultivated a style that comes across as refreshingly authentic in a time when it seems everyone else is dressing more and more alike. What caught my eye initially was her exuberant use of color. A refreshing lime green blouse, warm marigold block-heel sandals, and a burnt orange knit pullover are all items we find on regular rotation in her wardrobe. But rather than paying close attention to the trend cycle, Mekdela thinks bigger-picture. “I more so notice societal shifts, and how those may affect someone's dress,” she tells us. It seems she's achieved the type of thoughtful relationship with the clothes she wears that many of us only hope to gain over a lifetime. Considering her unique approach, we were curious to find out how she considers her own personal style to be a reflection of her cultural background, what inspires her most, and whether or not getting dressed changes for her from place to place. Which are the items in your closet you can’t live without? All of my scarves. Many were passed down to me. They wrap my hair, warm my neck, cover me after a swim, and carry my things. Which brands are “doing it right” right now in your opinion? Industry of all Nations for its transparency. Arkins for its steadfastness. Mara Hoffman for its voice. Patagonia for its depth. What countries and cultures do you find most inspirational when it comes to fashion? What I find inspiring about style is less specific to a country or culture and more about how someone moves through them. Immigrants impress me. That definitely started with my parents. Eritrean and Ethiopian, they went to Los Angeles in their late teens. I watched them precariously balance their heritage with the demands of assimilation. It was beautiful, and that struggle definitely came out in their clothes. I love when someone's style can tell you about special parts of who they are, not just who they've been around. What's your favorite thing about the style in Ethiopia? The story that’s found in the between old and new. A woman will be dressed for work, maybe wearing a pantsuit, and then have a netela draped over her head and around her shoulders, carrying a woven plastic basket of lunch. I love watching them help each other along in their heels, hopping from rock to rock on the dirt roads turned rivers during the rainy season. Did your style change when you moved? If so, how? I moved to New York from San Francisco, newly 20. I realize now, that I dressed to try and go unnoticed when I was younger. I just wanted to wear what everyone else was wearing. Growing older and moving to New York changed that. I didn’t have to focus so much on the reactions of other people, because there weren’t as many. Reactions, not people. More people meant less to be surprised about. But it also meant more to be curious about. I think New York makes people less judgmental and more interested. How do you feel that your cultural or geographical background has influenced your personal style?